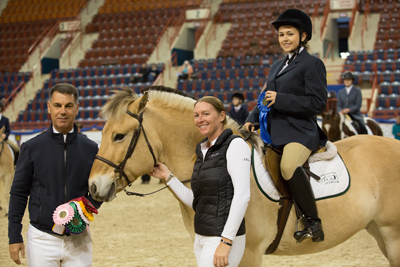 The Pennsylvania National Horse Show Foundation was once again pleased to host two Therapy Riding Championships as well as naming the 2017 Therapy Horse of the Year. 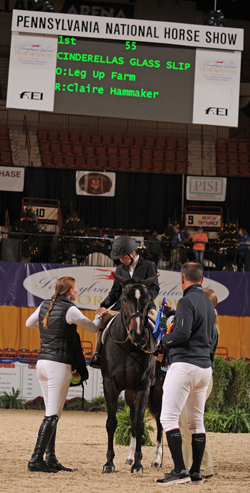 Classes judged riders’ abilities on equitation, position and communication with their horse. Winning the 2017 Assisted Therapy Championship was Claire Hammaker (left), Mt. Wolf, PA, riding “Cinderella’s Glass Slipper.” Winning the Unassisted Therapy Championship was Briana Rapuet (bottom), Harleyville, PA, riding “Lil Lilly.” Riders qualified by competing in designated shows throughout the summer at Columbia Riding Club , Thorncroft Equestrian Center, Friendly Horseman’s Club, Gettysburg Riding Club; and Leg Up Farm. The 2017 PNHS “Therapy Horse of the Year” is “Zipped in Black Magic” from All Riders Up, Garnet Valley, PA. Zip exhibits a unique ability to discern exactly what each individual rider needs from him on any given day. What makes him so extraordinary is that he himself is totally blind. Despite his own limitations, Zip is the go-to horse at All Riders Up, offering his own form of quiet confidence and reassurance. 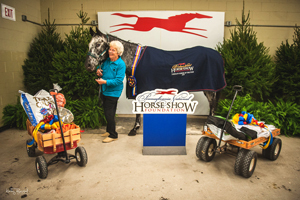 Zip was presented with a Horse of the Year embroidered cooler and a wagon full of treats, saddle pads, feed, carrots and tack. 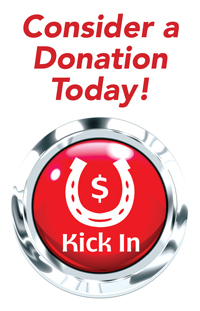 Established in 1999, the Pennsylvania National Horse Show Foundation, a 501(c)(3) tax-exempt non-profit organization, providing support for therapeutic riding and equine rescue programs. The Foundation makes grants exclusively for charitable and educational purposes to acquaint, teach and train the public in therapeutic equestrian endeavors and to support equine rescue efforts.